We encourage an inclusive atmosphere of wellbeing in the Home. Local performers regularly visit and entertain us with music, singing and dancing. Friends and volunteers often drop in for a cup of tea and a chat with residents. We encourage everyone to participate actively in the life of the Home. A morning walk in our garden to feed the birds, or the fish in our courtyard pond or do a little light weeding are individual choices, as are activities such as laying the dining table, arranging and tending flowers, distributing the post, and baking cakes for special events. 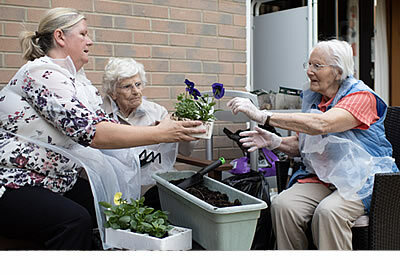 We help to keep residents involved by arranging daily activities in which they can choose to participate. 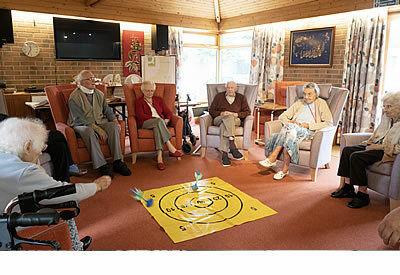 From exercise classes, games, quizzes and art projects to flower arranging, pamper sessions, and animal encounters, we ensure there is always something to enjoy and encourage socialising between residents. Morning and afternoon activities are usually arranged for every day of the week. 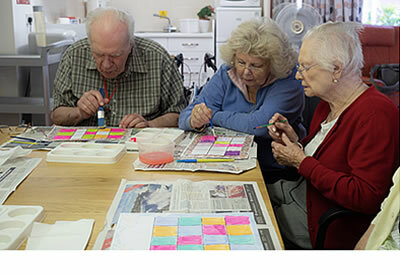 Guided by our Activities Coordinator, residents enjoy continuing their hobbies, including writing, gardening, painting, and playing chess. There is also plenty to do outside the home, and we take small groups of residents on trips to their chosen nearby places of interest. However, we also know and respect that our resident’s value having some time alone and we wish these moments to be as pleasurable as any other.